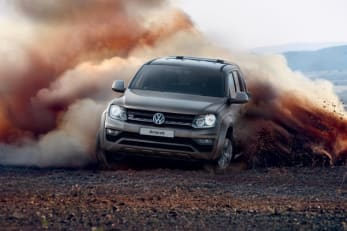 The powerful new Amarok is a classic pick-up that makes a big impression. 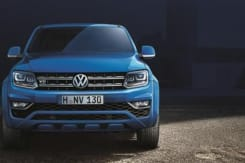 With a stream-lined front end and a completely new dashboard, Volkswagen’s latest commercial vehicle delivers on practicality, appearance and performance. 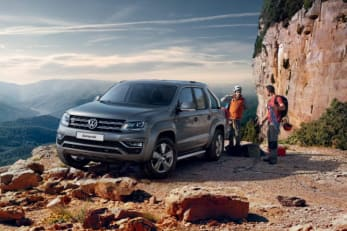 The Amarok provides a comfortable ride both on and off-road thanks to its high seating position, excellent all-round visibility and premium quality interior, which includes an attractive cockpit and the latest audio/navigation and mobile online systems. The new pick –up has also won awards for its new ergoComfort seats in the front which are adjustable 14-ways and have been awarded the ‘AGR’ seal of approval by the Healthy Back Campaign for providing outstanding back support. With a length of 5.25 metres and a width of 2.23 metres (mirrors included), the Amarok can accommodate a Euro-pallet loaded sideways. It’s also the only pick-up in the segment powered by 3.0-litre V6 turbodiesel engine which delivers 224 PS and 550 Nm of torque with a top speed of 120 mph and a 0-62mph acceleration time of just 7.9 seconds. 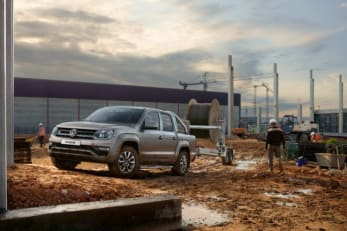 The Amarok is the only pick-up in its class to come with an Automatic Post-Collision Braking System, 17-inch disc brakes at the front and 16-inch disc brakes in the rear as standard. Make parking easy with park assist. It detects obstacles in front or behind the vehicle and also provides a visual display of the vehicle’s distance from the obstacles. *No ownership option. Plus VAT and with a customer initial rental. Business users only. Contract Hire agreement. Fair wear and tear charges may apply. Business users only. All Prices exclude VAT. VAT payable at the prevailing rate. At the end of the agreement ownership remains with Volkswagen Commercial Vehicle Financial Services, but provided all terms have been complied with, there are two options: i) commence a Secondary Hiring Period; or ii) customer sells the vehicle as Volkswagen Commercial Vehicle Financial Services' agent. Plus VAT. Business users only. Finance Lease agreement. Business users only. All Prices exclude VAT. VAT payable at the prevailing rate. The condition of the vehicle will affect the resale value and your sales proceeds. Subject to availability and status. 18s+. T&Cs apply. Offer available for vehicles ordered by 30/06/2019 from participating Van Centres. Indemnities may be required. Offers are not available in conjunction with any other offer and may be varied or withdrawn at any time. Accurate at time of publication 04|19. Freepost Volkswagen Commercial Vehicle Financial Services. Goodman Retail Limited is directly authorised by the Financial Conduct Authority (FCA) for consumer credit activities. Our Firm Reference Number (FRN) is 677629. Goodman Retail Limited is also an Appointed Representative of Sytner Group Limited, which is authorised and regulated by the FCA for Insurance Mediation Activities, under FRN 310540. Details of this and our trading names can be checked via the FCA consumer credit register. We are not an independent financial advisor. We can introduce you to a limited number of lenders to assist your purchase, who may pay us for introducing you to them. We can arrange finance for you. Advertised finance is provided by Volkswagen Financial Services (VWFS). Whilst we have close links with VWFS and commonly introduced customers to VWFS, we do not work exclusively with VWFS.